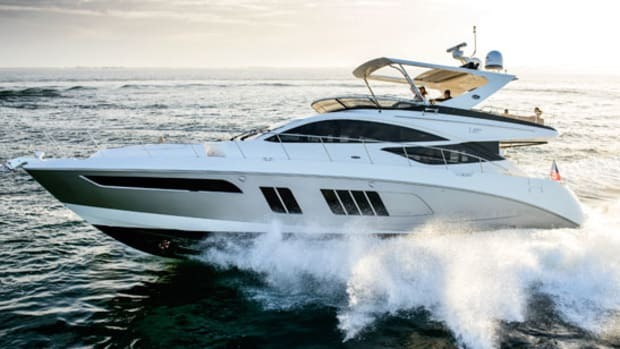 Sea Ray’s 510 Fly has oodles of plush onboard elbow room, a set of super-muscular scantlings, a mile-makin’ V-drive powerplant, and an out-of-the-box joystick option from Cummins. Climbing behind the wheel was purest déjà vu. 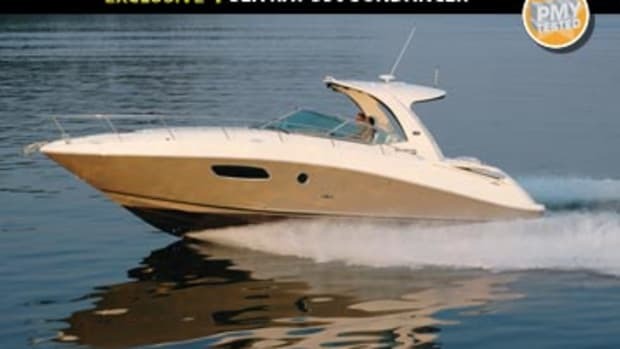 Over the years, I’ve sea trialed a passel of Sea Ray cruisers, express cruisers, fishboats, and performance boats (yup, Sea Ray once built speedsters as well as fishing craft) and, as always, the consistency of the brand engendered a certain comfy familiarity. I hunted the steering console for a moment, and soon found the Bennett tab controls, located to the right of the wheel and just below. 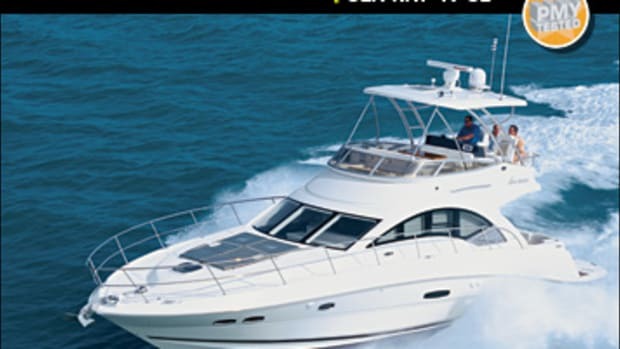 Then I checked our position via a Raymarine HybridTouch screen on the dash, cast a fast glance over the stern to make sure there was nobody coming, and, with a tingle of boat-drivin’ anticipation, eased the Twin Disc sticks off neutral and into the go-go realm. The ride was super smooth. A mile or so south of Bennett Causeway, with our 601-horsepower Cummins QSC8.3s going full chat, I spun the wheel to port with a vengeance, the point being to approximate maximum heel as well as the tactical diameter of a hardover turn. 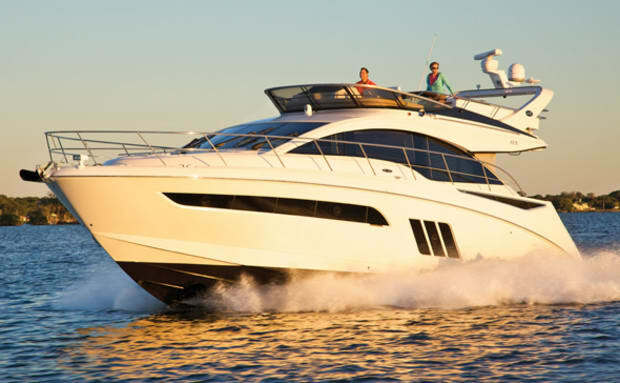 Our 510 answered her rudders with a comfortable but exhilarating inboard-leaning swoop. 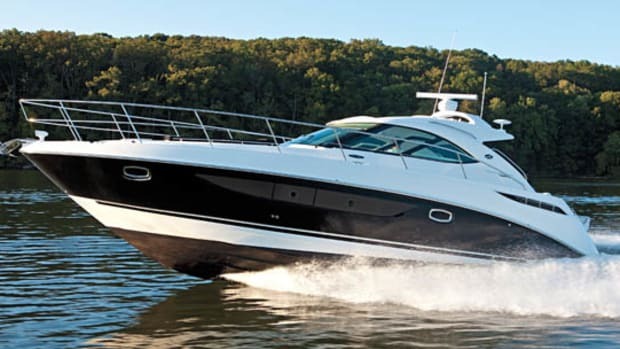 Looking back, I put the diameter of our turning circle at a broad three boat-lengths, maybe four, a finding that’s typical of inboard boats, especially those with widely-spaced props, rudders, and tunnels like the 510’s. “Very satisfying,” I noted while cranking another rousing turn, this one to starboard. The behavior that resulted was just as sure-footed and mannerly as before. No prop ventilation. No chine-hopping forward. No slide at the transom. No scariness at all. Just a good, solid, predictably enjoyable romp. If anything, the breezes were even more gusty back at the marina on Sykes Creek. 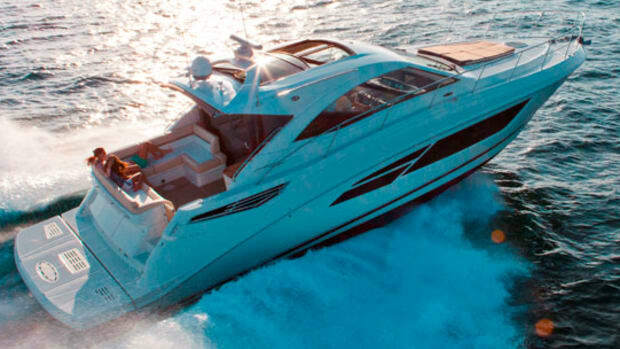 “Not exactly the best weather for docking a boat,” said our third crewmember, Bill Gowan, Sea Ray’s director of engineering. Gowan seemed a tad nervous. 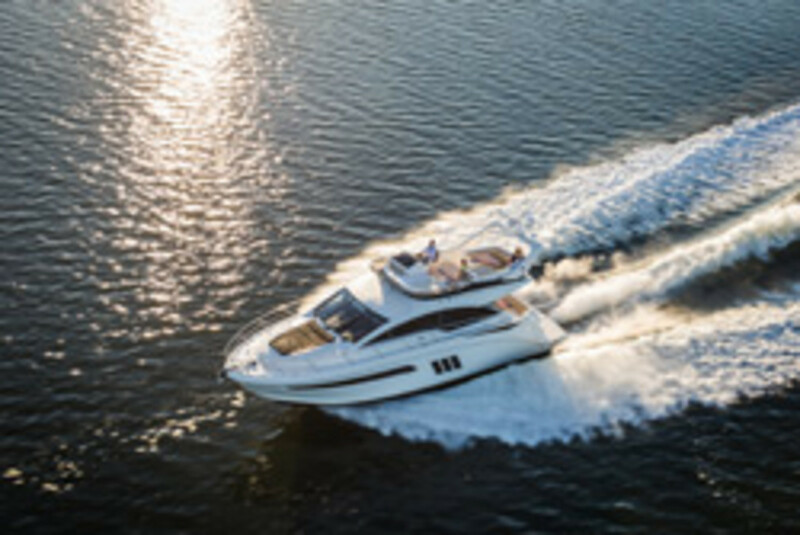 Our 510 was the very first Sea Ray to be outfitted with the new Cummins Inboard Joystick system, a nifty control package that uses computer technology to manipulate a twin-engine inboard’s mains and her bow thruster (as well as her stern thruster if fitted) to produce joystick maneuverability. Most likely Gowan was hoping I’d be favorably impressed with the system, once I’d finished backing the boat into her slip with the joystick and then again, for comparison’s sake, with the sticks alone, and one or both thrusters if needed. But Mother Nature didn’t seem to be cooperating fully. Our docking experiment went nicely, nevertheless. The joystick evinced roughly the same capabilities I’d experienced with Cummins Zeus and other pod-type products, although the upper helm station’s unit, which incorporated both bow and stern thrusters, generated more rotational oomph than the unit at the lower helm station which (for demonstration purposes) employed the bow thruster only. One minor foible announced itself, though. While the maneuverability I got from the new system was robust enough at both upper and lower stations despite the wind, it was also occasionally uneven and herky-jerky, a characteristic I attribute to our high-powered Vetus thrusters being non-proportional—they were either on or off, with nothing to soften thrust in between. How did the old-fashioned, sticks-alone technique stack up? I gotta say—backing the 510 into her slip with her binnacle controls (and just a couple of bow thruster taps at the onset) was pretty darn easy too, although in my opinion there’s one undeniable disadvantage to such old-timey arrangements, at least by comparison with virtually all modern joystick systems. If an inattentive, inexperienced or overly anxious boathandler gets himself into a dicey spot, I’d say there’s only one, wholly reliable tool that will save his bacon by smartly walking his boat sideways out of trouble: a joystick! And this feature alone, I think, justifies the moderate ($12,000) cost of adding the optional Cummins system to the 510’s V-drive configuration, a move that, after all, is considerably cheaper than opting for the pricier, more maintenance-intensive (albeit perhaps smoother and more precise) full-up joystick-enabled Cummins Zeus pod package ($99,167) that Sea Ray offers. “You’re gonna love this, Bill,” said Gowan with a grin, lifting a big hatch in the 510’s cockpit so I could check out the engine room. After descending a ladder with barefoot friendly composite treads, two things immediately struck me. First, the structure in the bottom of the boat was massive. The engine bearers, for example, (with drilled-and-tapped backing plates molded inside beneath the engine mounts, according to Gowan), were almost 10 inches wide, well over 18 inches high, and seriously buttressed by an array of equally beefy transversals, port and starboard. And second, the place was chock-a-block with top-shelf ancillaries, from a couple of shorepower-massaging Charles Industries IsoBoost Transformers outboard of the port engine to the thoughtfully-installed Groco sea strainers and Racor fuel-water separators at the rear, with each strainer logically positioned right above its matching separator. Moreover, the walkway between the mains was well over 3-feet wide, headroom was about 5 feet 5 inches, all dipsticks and filters were conveniently inboard-mounted, and an alcove forward (which held thruster batteries and electrics on our test boat but was designed to also house a Seakeeper gyro stabilizer if optioned) was appointed with carefully loomed, labeled, and tie-wrapped wiring, a big, solidly composed buss bar, and lots of rubber-booted insulators. 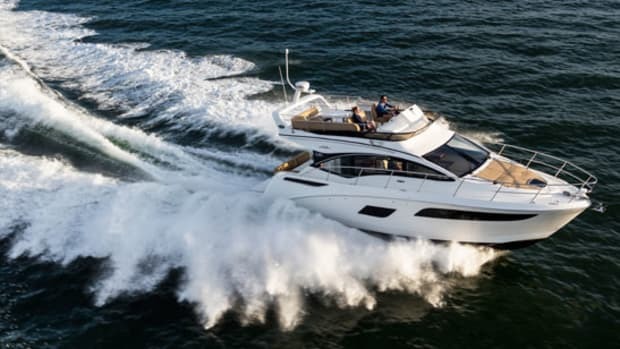 I toured our 510’s interior with Sea Ray’s program manager for product development Chris Walker, the guy who’d overseen the actual design and completion of the boat. The most striking aspect for me was the seeming immensity and layout of the full-beam, amidships master stateroom—not only was it huge, bright (thanks to three large, chevron-shaped windows on each side), and precisely finished, it had standup headroom where it was needed. Indeed, I found I could walk around the queen-sized berth like I was in a hotel, with nary a fear of knockin’ the ol’ noggin’. 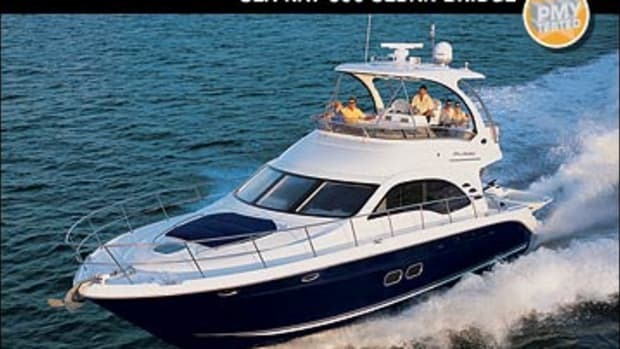 And the en suite head, just forward of the starboard-side dinette, only bolstered my enthusiasm, thanks to a residential-style tile floor and a comfy teak benchseat in the acrylic shower stall. The rest of the 510’s three-stateroom-two-head layout was fairly straightforward, except that the windows in the saloon were the largest ever installed on a Sea Ray, according to Walker, and the lazarette beneath the cockpit lounge was big enough to double as a crew’s quarters with a few modifications. And then there was one more rather nifty little detail. While the flying bridge was invitingly expansive (with lounge areas fore and aft) and boathandler-friendly (thanks to a large, easy-to-see-through companionway opening), it also offered a very innovative type of access. 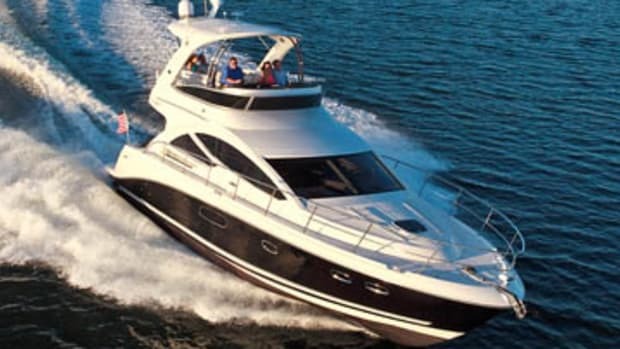 Instead of a hatch that swung open above the opening, Sea Ray had installed a sort of horizontal pocket-type door that slides sideways across it. When not in use, the darn thing is totally out of the way. Virtually invisible! 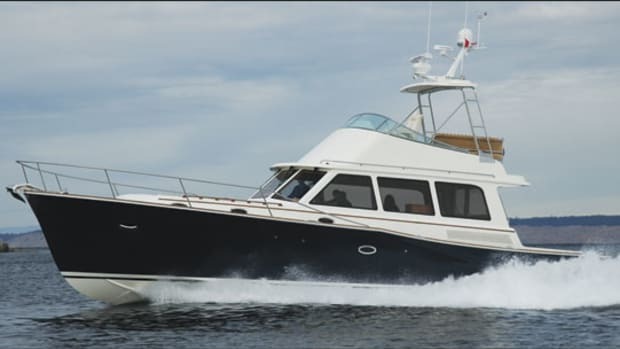 Noteworthy Options: Vetus bow and stern thrusters ($22,500); Cummins Inboard Joystick ($12,083); Cummins Zeus pod-drive package ($99,167); ProMariner inverter/charger ($6,500); Reverso oil-change system ($2,792); Splendide washer/dryer combo ($4,042); General Hydraulic Solutions hydraulic swim platform ($46,667). 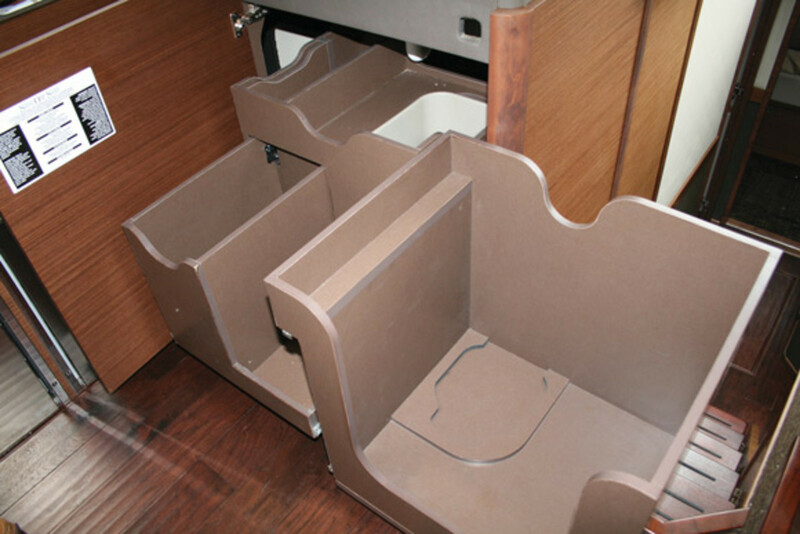 There’s an age-old problem with L-shaped cabinetry in a galley, or in a home for that matter. The juncture where the two legs of the ‘L’ meet is typically difficult to access, even if it’s inhabited by a whirling Lazy Susan—a contraption that still usually wastes space, inevitably develops rotational issues, and sometimes allows items to drop off into the seafaring version of Neverland. 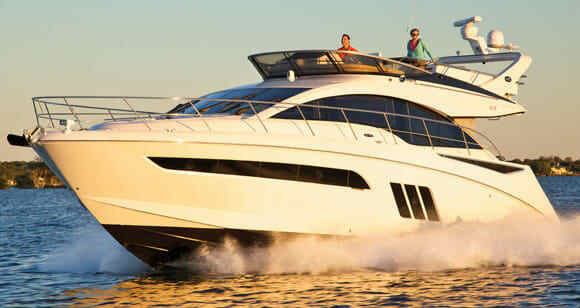 Enter the Sea Ray 510 Fly with the three-part bin-type arrangement shown above. Via a clever system of sliders, hinges, and other components, you simply pull gently and it unfolds from efficaciously filling the entirety of the juncture. Push gently and it goes smoothly back. Great solution to an age-old problem? Oh, yeah!